If you like Pina Coladas and getting caught in the rain…. The Caribbean Islands are calling your name! Situated in the Caribbean Sea, the Caribbean archipelago region is an impressive collection of more than 7,000 islands, islets, reefs, and cays, covering over approximately 1-million-square-miles of the region. There are 12 dependent territories and 13 sovereign island nations, with close political ties to the United States, UK, and France. The Caribbean region is located southeast of the Gulf of Mexico and the North American mainland, north of South America and east of Central America. Amongst the Caribbean plate, you will find a mix of geography and climates varying from flat terrains to higher elevations and some with minor volcanic features. The waters of the Caribbean sea are home to thousands of different species of fish, coral reefs, turtles, sharks, birds, and other wildlife. You will find a variety of languages spoken, but the most notable one is English. Since the British colonized of the islands, the governing system is similar to the British. Spain once ruled the larger islands in the Caribbean. These islands include Cuba and Hispaniola (is the island of Haiti and the Dominican Republic). 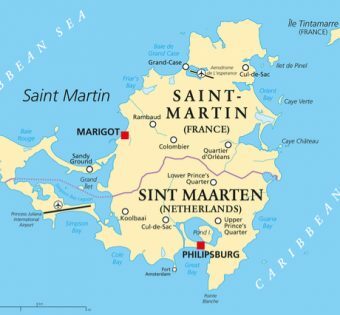 Some smaller islands speak Dutch and French. So, if you are ready for warm waters and some fun in the sun, the Caribbean islands are waiting for you.